Does the Bible teach that Water Baptism is essential to Salvation (necessary in order to be saved) or does the uniform lesson from Genesis through Revelation teach that man is saved by Grace through Faith (apart from external acts)? This is the question to be dealt with in this pamphlet to the encouragement of all Christians and to the help of any dear souls who have been deceived by a Satanic frustration of the "True Grace of God" (I Peter 5:12 & Gal. 2:21). Indeed, it is the difference between Heaven or Hell to know and believe (in the heart) THE TRUTH about God’s way of Salvation! "There is a way that seemeth right unto a man, but the end thereof are the ways of death" (Prov. 14:12 & 16:25). It will be helpful to the reader to carefully study the passages of Scripture that bear record of the conversion of Cornelius, the Roman Centurion (Acts 10:1-48, 11:1-18 & 15:11). Particular attention might be given to Peter’s rehearsal (in Acts 11) to his Jewish brethren at Jerusalem of what took place in Acts 10. In Acts 11:4-17, Peter recognized that which happened to Cornelius as a fulfillment of our Lord’s prophecy in Acts 1:5 (A repeat of John’s prophecy given in Matt. 3:11; Mark 1:8; Luke 3:16; John 1:33). This parallels I Cor. 12:13, which declares how we get into the One Body, the Church (Eph. 1:22-23; Col. 1:18 & 24), the only Church which Christ is building. The Lord adds to the Church daily and places the members in the One Body as it pleases Him (Acts 2:47 & I Cor. 12:18). Cornelius was Saved, Sanctified, and Sealed through the work of God before he was immersed in water. (What was true of Cornelius also was true of "All them which heard the Word" Acts 10:44). This fact can be proven to anyone who will "Search the Scriptures" (John 5:39; Acts 17:11) and believe God’s Eternal Word! * The Holy Spirit fell on him (Acts 10:44). * The Gift (dorea - same as in Acts 2:38; 17) of the Holy Spirit was poured out on him (Acts 10:45). * The Holy Spirit was received by him (Acts 10:47). ALL this before he was immersed in water!!!!! Someone may say that "Such was an exception!" But, my dear reader, one of the main lessons that Peter learned (perceived) was that God is no respecter of persons in Salvation (Acts 10:34; Acts 15:7-11; Eph. 6:9; Col. 3:25). Someone else may say, "I do not believe that the three things about the Holy Spirit’s relationship to Cornelius prove that he was saved before he was baptized in water!" Then please carefully consider the marvelous promises and relationships made sure to Cornelius and ALL others in this "Dispensation of the Grace of God! (Eph. 3:2) as a result of the indwelling Spirit - before water Baptism!! * He was not in the flesh but in the Spirit... Rom. 8:9. * He was led by the Spirit of God, therefore a Son of God...Rom. 8:14 & Gal. 4:6. * He was a Child of God and Heir of God... Rom. 8:16-17. * He was dwelling in God... I John 4:13. God was dwelling in him...I John 3:24 & I John 4:13. * He had "Obeyed" God... Acts 5:32 & Rom. 6:17. * He was sealed with the Holy Spirit of Promise...Eph. 1:12-13 & 4:30. This came about after Hearing & Believing (Compare also Acts 15:7 and the results which followed in verses 8-9). * He had the Love of God shed abroad in his heart...Rom. 5:5. * He received the promise of the Spirit through Faith & the Blessing of Abraham...Gal. 3:14. (This same Faith brought the Remission of Sins)...Acts 10:43. * He was in the Body of Christ, the Church (Assembly) which Christ is building...I Cor. 12:13. Please review the following passages for the uniform teaching of God’s Word on Baptism (Immersion) "In" the Spirit...Matt. 3:11; Mark 1:8; Luke 3:16; John 1:33; Acts 1:5; Acts 11:16; I Cor. 12:13 ASV. The preposition "with" in the KJV of the Bible is the preposition "In" (Greek EV) in the best Greek manuscripts in all seven (7) passages. Jesus Himself is the Baptizer. He was sanctified by the Holy Spirit...Rom. 15:16; I Cor. 6:11; II Thess. 2:13. Christians baptize believers because they have been saved. Cultists baptize "believers" in order to be saved. Next, let us consider a few facts related to Acts 2:38. It should be remembered that the advocates of "Baptismal Regeneration" (that water baptism is necessary to salvation) interpret "for the remission of sins" to mean "in order to have the remission of sins." The crux of their position is found in the word "for". A careful investigation of the Word will, however, dismiss such a notion that "for" is to be interpreted to mean "in order to". Please notice that John declares "I indeed baptize you in water unto repentance" (Matt. 3:11 ASV). Was it because they had repented or in order for them to repent? The meaning is obvious, they had already repented (see Matt. 3:8). Please note that the word "for" in Acts 2:38 are from the same Greek word. Now consider our Lord’s statement about Jonah’s preaching and the response of the Ninevehites. (Matt. 12:41). The word "at" in that verse and the word "for" in Acts 2:38 are again from the same Greek word. Did the men of Nineveh repent in order to get Jonah to preach or because of Jonah’s preaching. Again, the meaning is obvious, they repented because of his preaching. A further passage to consider is Mark 1:39-44. Here Jesus cleansed a man of leprosy (vs. 42), then sent him to the Priest. The man was obviously cleansed and with vivid reality possessed a testimony. Should "for" (same as Acts 2:38) be understood to mean "in order to" or "because of", which? Obviously the latter!!! Therefore, a consistent interpretation of the word "for" finds Peter commanding men to be baptized "because of" the remission of sins in Acts 2:38. A final consideration of Acts 2:38 reveals that there are three verbs in the verse: 1) Repent, 2) Be Baptized, 3) Shall Receive. Of the three, however, only two agree in person and number - Repent and Receive. This is consistent with the message of Peter in the next chapter where he says "Repent Ye therefore, and be converted, that your sins may be blotted out" (Acts 3:19). In answering the title question of this Pamphlet, Salvation always precedes Water Baptism in scripture! Christians baptize believers because they have been saved. 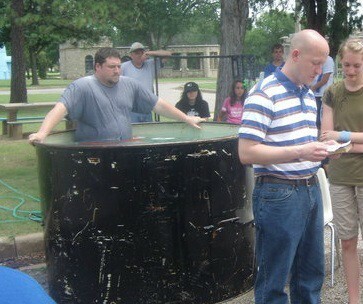 Cultist baptize "believers" in order to be saved. postscript: all believers should be baptized upon their conversion, by immersion, the Bible knows of no unbaptized believers.